With the advent of technology, portable USB devices like pen drives, flash drives, external hard drives, etc. help us to carry data on the go. But these devices have their own disadvantages. USB storage drives are prone to virus attacks as they may be plugged in to infected devices. In such cases, the data on the USB drives may get corrupted or even deleted. A USB drive may also fall into wrong hands; hence your privacy may be compromised. Several software programs offer features like password protection, encryption, access control, etc. to prevent unauthorized access and damage to your data. In this article, we’ll explore a few ways of protecting the data stored on USB storage devices. USB drive manufacturers like Sony, WD or SanDisk sometimes provide drive locker software along with their products. Such software programs use password authentication to restrict access to the drive. This is the most basic level of protection you can implement to prevent unauthorized access to your data. Most USB drives do not include security software of its own, so in order to secure the data, we need to resort to third party solutions. In fact, some third party USB protection programs offer versatile options; one such software program is StorageCrypt. 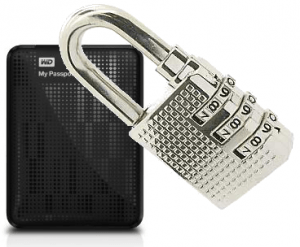 Password protection: Encrypt your data on USB (External hard drive, Pen drive etc.) drives with password. Hidden drives: Protected drives are automatically unmounted, hence preventing data access and protect the drive from being formatted. Speed: Quick encryption and decryption mode available, although deep encryption mode (more secured) is also supported, which takes more time compared to quick encryption. Software portability: Portable mode is available to encrypt and decrypt USB drives independently (Windows Only). Plug your USB device (pen drives, external hard drives, etc.) and run StorageCrypt. Enter your password two times and hit the Encrypt button to lock your drive. A bleep sound confirms the operation. Your USB drive is now encrypted and locked by password. The contents of the drive are inaccessible unless it is unlocked again. Plug in and open your encrypted drive. You will be having a file called SClite.exe inside a folder named SClite. Run the SClite.exe file. Note: In case you don’t find the SClite folder, directly run StorageCrypt from your local system. Provide the password and click on Decrypt to unlock your drive. Once you’re done, close the previously opened SClite window and run SClite.exe file again. This time you’ll get the option to lock the drive. StorageCrypt is a Shareware with a 7 day trial period. If you want to continue after the trial, you need to purchase a lifetime license. Install it to your local system instead of external drive. The software doesn’t have any way to recover your password. So, if you forget your password, you cannot recover the protected data. The newer version of the software can decrypt the drive that is encrypted by older version, but an older version can’t decrypt the drive that is encrypted by a newer one. USB Copy Protection is a third party software similar to StorageCrypt, but in addition to encryption, it also provides multiple levels of user access to the data. This feature can be used to protect your drive from infected systems by disabling write access. Copy Protection: Prevent unauthorized modification of your drive contents, including read and write operations. Multi-Format support: Restrict access to multiple file formats, namely DOC, XLS, PPT, PDF, TXT, Flash, EXE, CAD, PSD and so on. Portability: Protect files on you your USB drive without the need of installing any software. Permissions: Assign multiple access permissions to multiple users and control their access levels. Encryption: The software uses the one of the strongest AES 256 bit encryption to protect data. Download and install USB Copy Protection on your computer. Plug in the USB drive and launch the software. The USB drive should be listed in the Select Drives tab. If it doesn’t show up, click the Refresh button on the right side. Now select the particular USB drive you want to protect using USB Copy Protection. Now click on the Permissions tab. Here you can define different access levels for different users. The different access levels which may be assigned are Read, Write, Full or Custom. Additionally, you may also set the password for different users. If Custom access is selected, you can explicitly define user access permissions for the particular user. Now, proceed to the Options tab to configure the encryption strength and the Client name and title. Finally click on the Encrypt Now tab, type the Administrator password twice and click on Protect. Your drive is now protected with the configured access permissions. If you open the drive in Windows Explorer, only the USB Copy Protection Client file will be available. Run the client by double clicking on the file. Now login with valid user credentials. Read Access: User is able to browse through the files and copy them to the computer. Write Access: User is able to perform every operation in read access and can additionally import files from the computer to the USB drive. Full Access: User is able to perform all operations. If you wish to remove the USB Copy Protection client from your drive, run the client and login with admin account. Now click on the Manage option in the File menu and select Complete Unprotect. You may be asked to enter the Administrator password. Thus, third party software programs like StorageCrypt and USB Copy Protection can help secure data stored in pen drives or external hard drives. Depending on your requirements, you may choose any of these programs; or you may use a combination of multiple programs to add some extra layers of security. A very good example of multi-layered protection would be using all the three available security options. Note: If you are not comfortable with all these programs, we do not recommend you to implement multi-layered security. The following process should be attempted only if you have a good understanding of these programs. Consider splitting up your external hard drive into different partitions. Now assign public and private access to each of these partitions using StorageCrypt as follows: one private partition to store your personal data, one public partition for storing general files and another public partition for transferring data among devices. Now encrypt the private partition using StorageCrypt; the SClite folder will be created inside the first public partition (i.e. the general partition). Next, use USB Copy Protection for securing both the public partitions, assigning only read access to the general partition, while providing write access to the data transfer partition. Finally, use the built-in software for overall protection of your external drive, if possible. A USB drive implementing such layered security will be protected against common threats. First, the built-in security would prevent the drive from mounting on to the plugged in system. If this layer is unlocked, only the public partitions would be accessible under their respective access permissions. The general drive is protected against virus infections, as it is write protected. In order to access the private partition, one has to run SClite.exe from the SClite folder inside the general partition (within the USB Copy Protection interface) and provide the correct password.